Gunslinger Black Powder Hits #46 on Cigar Press Magazine’s Top 100! Home » NEWS » Gunslinger Black Powder Hits #46 on Cigar Press Magazine’s Top 100! Check out Cigar Press Magazine’s Top 100 cigars for 2017! Gunslinger Cigar’s Black Powder jumps into the rankings at #46! 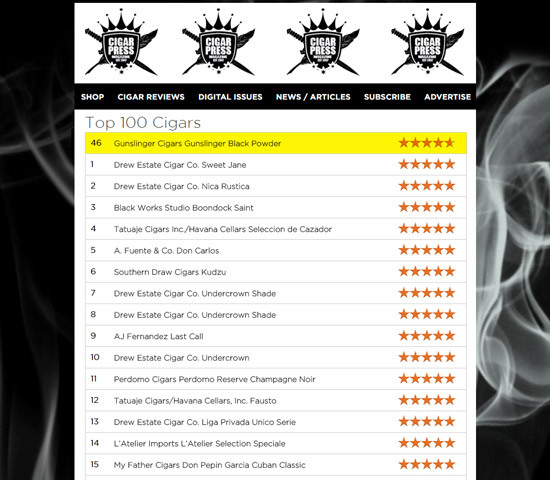 We think its #1, but we are excited to be part of this amazing list of cigars!